UNDERSTANDING THE DIFFERENCE: Below is an example of a “Text & Logo” design and a “Merged Graphic” design. Before explaining the pros & cons of each, it’s necessary to clearly understand the differences between these two styles of email signatures. It’s easiest to think of email signatures as consisting of three components - two components are visible, and one is invisible. The visible components are graphics and text. The diagram below separates the two signatures above into their visible components. As you can see, both signatures contain a combination of graphics and text - it’s the proportion of text vs. graphics that differs between them. The third, unseen, component is the HTML programming that displays the signatures and makes the hyperlinks work. This programming is reasonably equivalent between the two styles and is not of much importance when looking at the pros and cons. PROS AND CONS: These two types of signatures will behave very differently in use. We have produced both types for years, and have extensive experience in supporting each of these. If we could recommend one over the other, this would be easier. However, in our experience we’ve found them to be quite evenly matched, so the best we can do here is to discuss the primary differences and let you reach your own conclusion. The text will always appear to the email recipient - image blocking will never stop it. The text can be recognized by “smart” email applications, enabling extended functionality such as click-to-call. The text will appear as expected, but without special formatting, when the signature is used to reply to an email message in “plain text” mode. Smartphones will resize the text according to whatever protocols they have built in - assisting in its readability when shown on small screens. The text can be copied and pasted if desired. The layout of the signature is quite limited by the many HTML constraints that occur the realm of email signatures. The appearance of the signature to recipients may not be exactly as expected - spacing between lines and elements can increase, font sizing can change, font colors may change to blue and underlines may be added when hyperlinks are recognized, the proportionate size between logos and text can change relative to one another when displayed in smartphones, and text can wrap in unintended ways when the signature is displayed in small windows. The design and layout can be much more precise - line spacing can be controlled to the level of a single pixel. The design can be fancier - allowing for things like drop shadows on fonts, and fonts of any color, including white, overlaid on background images. Other than the potential for image-blocking (which effects the logos equally in the text and logo style), the likelihood of the recipient seeing the signature exactly as intended is GREATLY enhanced. About the only thing that may change is that the signature may be reduced in size automatically (and proportionally) by some smartphones. When the image is blocked, the sender’s contact information may be temporarily inaccessible to the message recipient. In many cases the text will show up in what’s called the ALT TAG - though ALT TAGS are not supported as reliably as they once were. None of the contact information that’s included in the merged-graphic will be recognizable by the smart functions such as click-to-call that are increasingly built into email programs. Little if any of the contact information will automatically transfer to the “plain text” version of the signature - that will need to be set up separately (good to do no matter what - and we’ll provide simple to follow instructions). 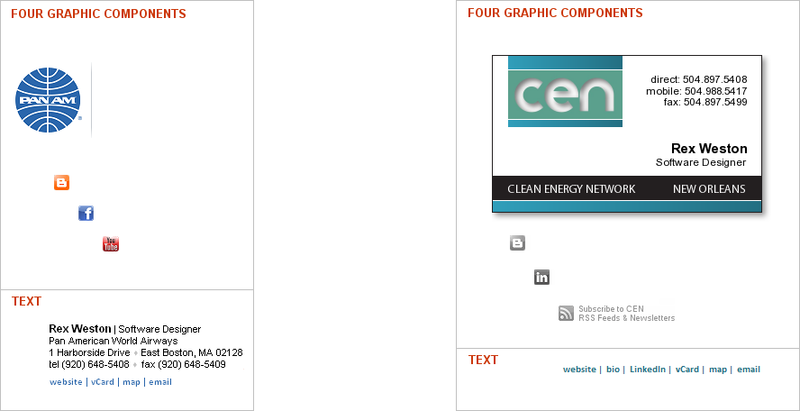 If a smartphone scales down the size of the graphic significantly, the contact information may become difficult for the recipient to read. It becomes more difficult to deal with user anomalies - extremely lengthy names, titles, or credentials, or special requirements such as multiple physical addresses or a need to list the names and phone numbers of assistants.